Local author Brian E Davies has brought out a book that is sure to have you reminiscing. 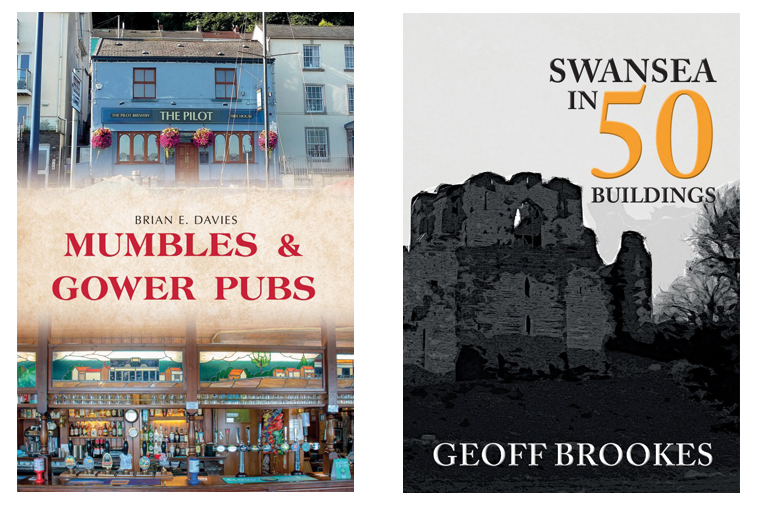 Mumbles & Gower Pubs published by Amberley includes all the pubs that you remember along with those that you may have forgotten about and some that you will never have heard of. Swansea in 50 Buildings, explores the history of this ‘ugly lovely town’ through a selection of its greatest architectural treasures, from the early 20th century Guildhall with its striking Art Deco clock tower, to more recent additions such as the Meridian Tower. Local author and historian Geoff Brookes celebrates Swansea’s architectural heritage in a new and accessible way. Richard Porch’s latest book looks at the life of Ernest Morgan – you may not know the name but you will certainly be familiar with his work. He’s the man responsible for some of Swansea’s most famous landmarks from the Alexander building on Alexander Road, the Junction Café on Mumbles Road and the libraries of Sketty, Oystermouth and Llansamlet. Ernest Morgan was born in Swansea in 1881 and was appointed as the first ever Swansea Borough Architect in 1913. Thirty-four years and two World Wars later he retired in 1947; but during those years he was responsible for most of the public architecture in Swansea, from the Garden City development of Townhill/Mayhill to the schools, public libraries and cenotaph. When Amiel Price sent me a copy of her book, I was looking for the Swansea connection. I soon found myself immersed in a love story constructed from Amiel’s maternal grandmother’s (also called Amiel) letters from her fiancé who was fighting in WWI. Norman’s letters to his fiancée make up the bulk of the story as sadly Norman didn’t return from the war and Amiel’s letters to him didn’t survive. The Swansea connection? Norman’s battalion came to a camp in Singleton Park and in his letters he describes his walks to Mumbles and Langland Bay. Amiel eventually married and moved to Llanelli – during the Second World War she would take her children to stay at the Brynfield Hotel in Langland. In one of his letters Norman suggest that Langland Bay would make a lovely place to honeymoon. Norman’s letters are interesting not just because of the social history, but his charming little cartoons are so typical of their time. A new book helps preserve an important characteristic of an historic corner of Wales. The dialect local to the Gower peninsula evolved separately from its roots in England – and now has its own handy reference work. The Gower Glossary highlights hundreds of words which were once the linguistic currency of south Gower. Written by Rob Penhallurick and Benjamin A Jones, it is one of 50-plus projects delivered by the Gower Landscape Partnership, a £1.9m initiative inspiring people to look after the area’s distinctive features. Funding came from the Heritage Lottery Fund, Welsh Government, National Trust and Natural Resources Wales, with Swansea Council the lead partner. English has been spoken in Gower for longer than most parts of Wales. The evidence is that the early pioneers sailed from Somerset and Devon and settled in the south of the peninsula after the fertile land there had been taken over by the invading Normans. North Gower as a rule remained Welsh-speaking — a situation reinforced centuries later when coal was discovered, attracting many Welsh-speaking workers. This book brings together hundreds of words which were once the linguistic currency of south Gower. This limited edition book is being distributed to Swansea’s schools, libraries and a number of community organisations. It has English and Welsh editions. Saturday 24 November sees the return of this well-loved event, it opens between 12 noon and 15.00 in St.Hilary’s Parish Centre, behind the church, entry 50p (children free). Book stall, Jigsaws, the ubiquitous cake stall, followed by a mouth-watering savouries stall, hot and tasty soup will be served too. There will be toiletries and jewellery – and plenty of fun and games for young people. Don’t forget the big raffle – tickets will be on sale at the event, the draw itself will take place following the Parish Carol Service on Wednesday 12 December. St Hilary’s is a com-munity church, well used by families from Killay, Dunvant and Three Crosses. All monies raised at this event will go towards keeping the doors of the church open for use by the community. 12–17 December 10.00 – 18.00. Come along and see over 15 Christmas trees decorated by church and community groups, local schools and local businesses. This year’s theme is ‘Christmas around the world’ – every tree will be different, every tree will have an explanation of its decoration included in a colour programme available at the church – price 50p. Learn more about the various Christian traditions from far-flung countries across the globe. The event opens with the Parish Carol Service on Wednesday 12 December at 19.00 – come along and sing traditional carols in the darkened church, surrounded by the sparking lights of all the Christmas Trees – followed by refreshments in the Parish Centre. Not looking forward to Christmas this year due to a bereavment? On Thursday 13 December at 18.00 there will be a Memorial Carol Service in association with Eddie Tucker Funeral Directors, there will be an opportunity for quiet reflection, you can light a candle, and leave a special bauble on the Memorial Tree. Swansea City supporters haven’t perhaps had much to cheer about in recent times so we thought we would dip into David Roberts’ latest pictorial nostalgia book, Swansea – The time of our lives, for a peep back to happier times. 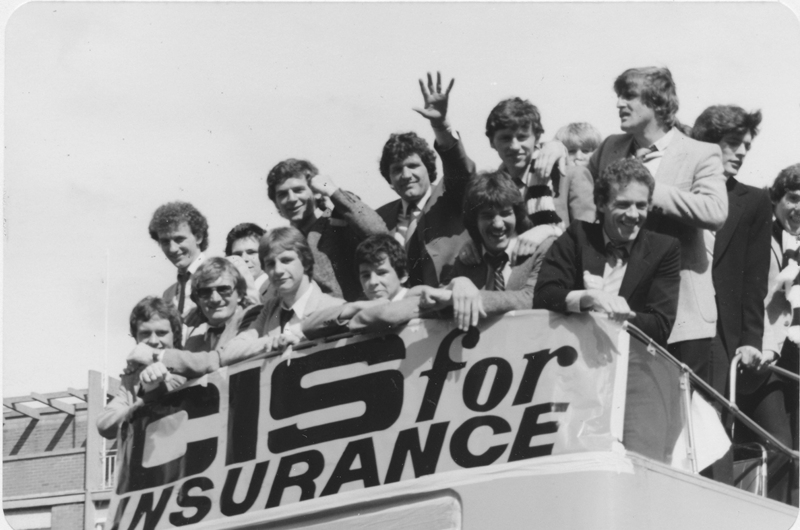 This picture shows Swansea City players including John Toshack aboard an open top double decker bus which carried them on a victory parade through the city centre to celebrate the club winning promotion to Division One, in 1981. Those who remember the event will say that it was the best of times though eventually short lived. Let’s hope the current team can deliver for the manager and fans in the coming weeks. The picture is taken from David’s recently released book. The book is one of many in David’s latest tome, the 21st in as many consecutive years and an amazing achievement. For details on how to buy a copy of the book contact Bryngold Books on www.bryngoldbooks.com or phone 01639 643961. Caption for image: Swansea City players celebrate after one of the most successful seasons in the club’s history ….after gaining promotion to the Premier League of course! 1 December at St Paul’s Church Hall from 9.30 – 12.30 There’s plenty and free parking on site. Additional to the usual stalls of patisserie, cards, books, local honey, pies, jams and chutneys, jewellery, hemp products, green grocer (including eggs, milk and butter), items for pets and a variety of plants (with home delivery), there will be on sale Christmas biscuits, Baileys fudge, cinnamon muffins, lots of different breads, Welsh cakes baked on the stall, Christmas stockings, vintage shopping bags, mulled wine and home baked mince pies. St Paul’s Church will be selling calendars and there will also be a raffle. One of the most popular choral works will be performed at the winter concert of the Gower Chorale on Saturday 19 January, at All Saints Church, Oystermouth. Faure’s Requiem is a favourite with choristers and audiences alike. It is complemented for this concert by Rossini’s Stabat Mater, performed less often but full of wonderful melody to delight and warm the hearts of all on a cold January night. Soloists will be soprano Phillippa Scammell, mezzo soprano Helen Stanley, tenor Robyn Lyn Evans and bass Meilir Jones. The Festival Orchestra of Wales will be accompany-ing the singers and the conductor will be Dr William Reynolds, Gower Chorale’s musical director. The concert begins at 19.00; tickets at £15 can be obtained from 01792 404391 / 207950 and The Gower Gallery, 530 Mumbles Road, 01792 368669, under 15s FREE. The NT Abertawe centre meet on the 4th Wednesday of each month – except December at Sketty Parish Hall in Delabeche Road at 19.30. 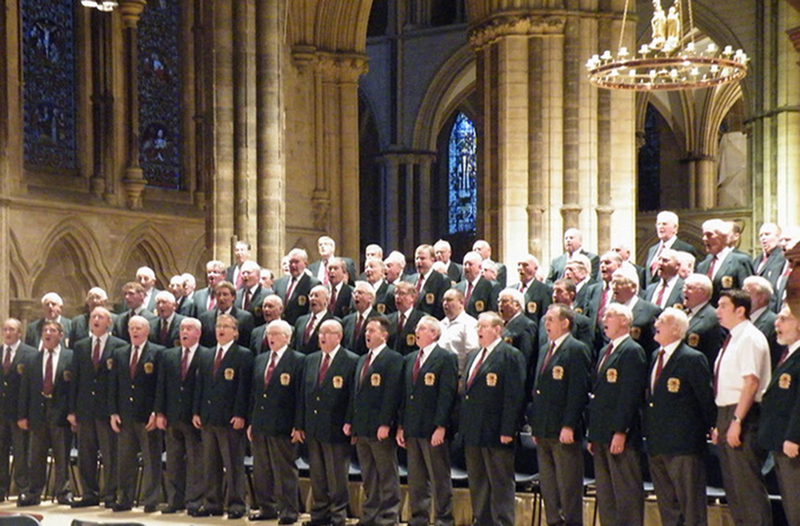 The Pontarddulais Male Choir annual concert will be held at the Brangwyn Hall on Saturday 24 November at 19.00. Guest Artists will be Tristan Llyr Griffiths Tenor, and Elin Manahan Thomas Soprano. Tickets are £15 from any choir member or pay at the door. Local storyteller Carl Gough tells the tale of Jack, who saved 27 lives in the 1930s and remains the only dog to ever be awarded two bronze medals – the canine equivalent of the Victoria Cross. This event starts at 19.00 at the Llewellyn Theatre, Swansea YMCA, 1 Kingsway SA1. Swansea Bach Choir present their traditional Christmas concerts filled with delicious music, mince pies and mulled wine. Get ready for the St Peter’s Church Newton Christmas Fair, which this year falls on Saturday 17 November. The Fair will be held in Newton Village Hall (next door to the Church), from 10.00 until 12 noon. A variety of very popular stalls, will present an opportunity for early birds to do their Christmas shopping, as well as fun games for adults and children. Tea, coffee and delicious cakes will also be available. The Fair increases in popularity every year so make sure you make a note in your diary. Poet Alan F Rees was born and raised in Swansea and served with the British Army’s Royal Engineers from 1955-1958, going on to run his own business. Alan, now 81, started writing song lyrics in the early 1970s, submitting them to publishers. But it was after his wife Linda started her second degree in English Literature that he started to write poetry. Why? 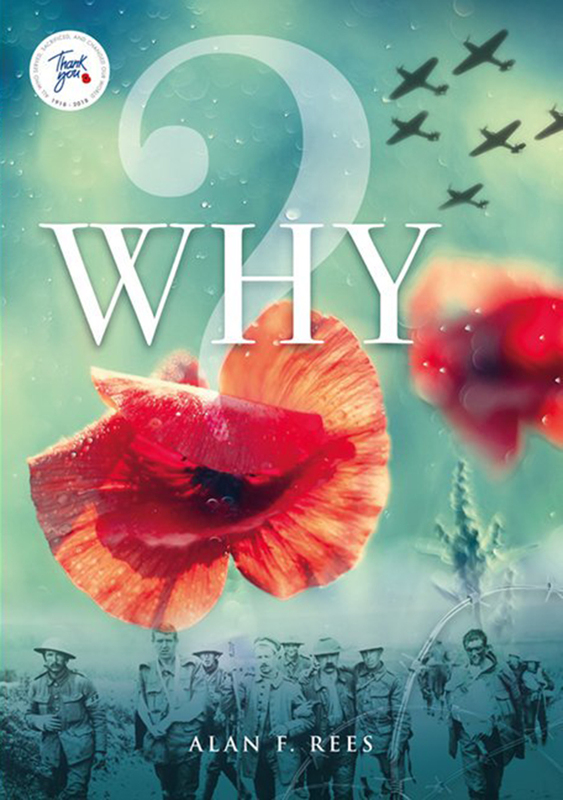 is Alan’s debut collection of poetry about the First World War. It was launched at the Wales Air Show on 30 June 2018 as part of the WW1 Centenary, and is released in association with the Royal British Legion. They grew in haphazard profusion, simply scattered all around, in singles and groups–all sown in confusion over the ruined ground. Their centres shining black their petals a unique shade of red, if counted maybe one poppy grew–for each young soldier dead. A new poem has been written by Carol Ann Duffy to mark the centenary of Armistice Day. The Wound in Time will be read by individuals, families and communities as they gather on beaches on 11 November.